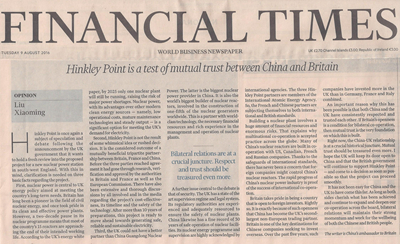 The Financial Times Publishes A Signed Article by Ambassador Liu Xiaoming Entitled "Mutual trust is the foundation of China-UK cooperation -- Hinkley Point is a test of mutual trust between China and Britain"
Hinkley Point is once again a subject of speculation and debate following the announcement by the UK government that it wants to hold a fresh review into the proposed project for a new nuclear power station in south-west England. With this in mind, clarification is needed on three basic facts regarding the project. First, nuclear power is central to UK energy policy aimed at meeting the country's long-term needs. Britain has long been a pioneer in the field of civil nuclear energy, and once took pride in its clean and effective power plants. However, a two-decade pause in its nuclear programme means that most of the country's 15 reactors are approaching the end of their intended working life. According to the UK's energy white paper, by 2025 only one nuclear plant will still be running, raising the risk of major power shortages. Nuclear power, with its advantages over other modern clean energy sources - namely, low operational costs, mature maintenance technologies and steady output - is a significant option for meeting the UK's demand for electricity. Second, Hinkley Point is not the result of some whimsical idea or rushed decision. It is the considered outcome of a mutually beneficial tripartite partnership between Britain, France and China. Before the three parties reached agreement it had gone through research, verification and approval by the authorities in Britain and France as well as the European Commission. There have also been extensive and thorough discussions by all involved and in the media regarding the project's cost-effectiveness, its timeline and the safety of the technology. After more than 10 years of preparations, this project is ready to move ahead towards generating safe, reliable and sustainable electricity. Third, the UK could not have a better partner than the China General Nuclear Power Corporation. The latter is the biggest nuclear power provider in China. It is also the world's biggest builder of nuclear reactors, involved in the construction of one-fifth of the nuclear generators worldwide. This is a partner with world-class technology, the necessary financial resources and rich experience in the management and operation of nuclear plants. A further issue central to the debate is that of security. The UK has a state of the art supervision regime and legal system. Its regulatory authorities are experienced and adequately resourced to ensure the safety of nuclear plants. China likewise has a fine record of 30 years of safe operation of nuclear facilities. Its nuclear energy programme and supervision are highly acknowledged by international agencies. The three Hinkley Point partners are members of the International Atomic Energy Agency. So, the French and Chinese partners are subjecting themselves to both international and British standards. Building a nuclear plant involves a huge amount of financial resources and enormous risks. That explains why multinational co-operation is accepted practice across the globe. Many of China's nuclear reactors are built in co-operation with US, Canadian, French and Russian companies. Thanks to the safeguards of international standards, there has never been a concern that foreign companies might control China's nuclear reactors. The rapid progress of China's nuclear power industry is proof of the success of international co-operation. Britain takes pride in being a country that is open to foreign investors. Rightly so. It is exactly because of such openness that China has become the UK's second-largest non-European trading partner. Britain is one of the key destinations for Chinese companies seeking to invest overseas. Over the past five years, such companies have invested more in the UK than in Germany, France and Italy combined. An important reason why this has been possible is that both China and the UK have consistently respected and trusted each other. If Britain's openness is a condition for bilateral co-operation, then mutual trust is the very foundation on which this is built. Right now, the China-UK relationship is at a crucial historical juncture. Mutual trust should be treasured even more. I hope the UK will keep its door open to China and that the British government will continue to support Hinkley Point - and come to a decision as soon as possible so that the project can proceed smoothly. It has not been easy for China and the UK to have come this far. As long as both sides cherish what has been achieved and continue to expand and deepen our co-operation across the board, bilateral relations will maintain their strong momentum and work for the wellbeing of both the Chinese and British people.